The Sinaqua Indians built the first buildings of what is now known as Tuzigoot around A.D. 1000. They expanded their village or pueblo until it consisted of 110 rooms, including second and third story structures. In 1932, a survey party led by Earl Jones brought Tuzigoot to national attention. 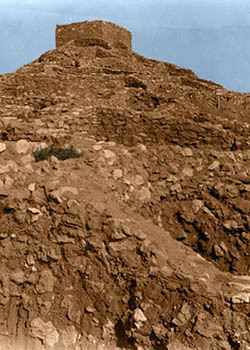 The following year, the Arizona State Museum and the Yavapi County Chamber of Commerce Archaeological Committee sponsored excavations at Tuzigoot under the direction of archeologists Louis R. Caywood and Edward H. Spicer. This work continued with the assistance of Federal Emergency Relief Labor, a work relief program during the Great Depression. The Civil Works Administration took over the project and it continued under the Caywood, Spicer, Harry T. Getty, and Gordon C. Baldwin. Through the interest of local citizens, on July 25, 1939 the entire hill of Tuzigoot and its complete museum and collections was donated to the federal government by the Verde School District. On this same date, Tuzigoot National Monument was established by Presidential Proclamation on 43 acres of land for “historic and prehistoric structures and other objects of historic or scientific interest” (Proc. No. 2344). Today, approximately 116,000 people every year visit Tuzigoot National Monument. The site includes the 86-room pueblo dating to the 13th and 12th centuries that was first excavated by Caywood and Spicer. One of archeologists’ major projects today is their involvement in work to remove the cement previously used to stabilize the structure. This now-outdated treatment will be replaced with a more preservation- and historically-appropriate surface. Visitors can follow trails to the pueblo and see at the visitor center some of the Monument’s 22,000 artifacts, including lithics, oyas, ceramics and more.